An internationally renowned Anglo-Irish string quartet based in the UK, the versatile and award-winning Carducci String Quartet has performed everything from brand new quartets, classic works by Haydn, complete Shostakovich cycles, and even partnered with folk-rock icon Ian Anderson of Jethro Tull. Founded in 1997, the quartet has won numerous international competitions, including the Concert Artists Guild International Competition 2007 in New York and First Prize at Finland’s Kuhmo International Chamber Music Competition 2004. In 2016, they took home a Royal Philharmonic Society Award for their performances of cycles of the complete Shostakovich Quartets. 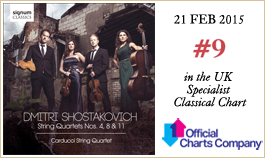 This Shostakovich15 project was accompanied by a recording of quartets Nos 4, 8 and 11—their second disc for Signum Classics, and it was recognised by BBC Music Magazine as 'a fine achievement, boasting excellent ensemble, musical insight and sensitive attention to detail'. The quartet has released a bevy of acclaimed recordings on their own label, Carducci Classics, as well as Signum Classics. Their recordings of Philip Glass Quartets have had over six million plays on Spotify. Described by The Strad as presenting 'a masterclass in unanimity of musical purpose, in which severity could melt seamlessly into charm, and drama into geniality', the Carducci Quartet is recognised as one of today’s most successful string quartets. Performing over 90 concerts worldwide each year, the quartet also run an annual festival in Highnam, Gloucester.